Less than two hours ago, Chase Community Giving made the much anticipated unofficial post on its wall announcing the lucky winner of $1 million dollars and five finalists each receiving $100,000 on its contest Fan Page. This contest was the culmination of a two-part "vote for me" cause marketing strategy that started in November and has been rife with controversy. In some ways, it comes as no surprise that the race to the finish line ended with more allegations of dubious behavior by contest participants and those watching them compete. It's left some nonprofit professionals wondering whether these types of contests are a good idea. In the contest's last few hours, many newly created profiles voted for The Isha Foundation, some of them with dubious-looking names, including Gdfg Kcjbvkljvb and Sdfj Dfsjlfkddjf. Several other profiles with more realistic names voted for Isha, though these accounts have had few if any friends or activity prior to voting.Though many of the profiles supporting The Isha Foundation appear to be new with little to no activity, it's unclear if that is a violation of the terms and conditions of participating in the contest. Invisible Children has also been accused of fraud during the duration of the contest. Change.org reported on January 19 that many users who had not voted for Invisible Children had been tagged in a photo with an image reading "I Voted For Invisible Children," making it appear as though that user had voted for the group. Voting for the Chase Community Giving contest ended at midnight on January 23, with an official announcement of the winner coming on Monday, January 26. It is unknown whether Chase and Facebook will be verifying the legitimacy of vote counts after the contest has ended. JPMorgan Chase & Company is coming under fire for the way it conducted an online contest to award millions of dollars to 100 charities. At least three nonprofit groups — Students for Sensible Drug Policy, the Marijuana Policy Project and an anti-abortion group, Justice for All— say they believe that Chase disqualified them over concerns about associating its name with their missions. The groups say that until Chase made changes to the contest, they appeared to be among the top 100 vote-getters. Dubbed the Chase Bank's Online Contest Fail and a firestorm of criticism followed. The disqualified groups organized a boycott of Chase and probably would have ignited an angry crowd if not a matter of timing. The events happened right before Christmas when everyone distracted by holiday celebrations. 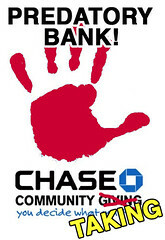 Chase Bank did not apparently make any formal, public concessions to the disqualified groups and the nonprofits decided to move on. 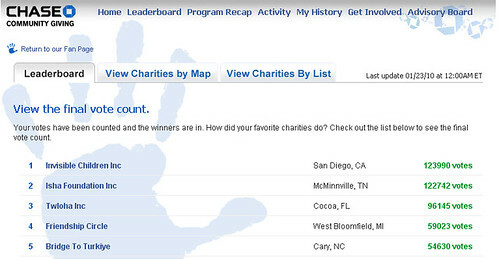 All week, I watched the organizations competing in the Chase Community Giving Contest go up and down the leaderboard amid accusations of dubious behavior and tactics by those participating in the contest. Scarcity thinking also inspires less than honest tactics. It doesn't promote thoughtfulness or field wide learning. Further, for organizations that are pestering their supporters and friends to "vote for me" has the potential of eroding the hard earned social capital. It does not promote the good kind of relationship building that can really sustain an organization in the long run. It promotes transactional relationships. 2. The Role of Experts: There is a role for expert opinion in crowdsourcing projects to make them more effective. 3. A Balance of Social Good and Marketing: Can throwing a lot of money out there for nonprofits to beg for really solve social problems or make the world a better place? There needs to be a balance of social good and cause marketing or else it might come off as "cause washing." We know that corporate greed is being replaced by generosity and we know there is potential synergy between financial performance and attention to community and social needs. But it can't be a pure marketing strategy - there needs to be some theory of change. 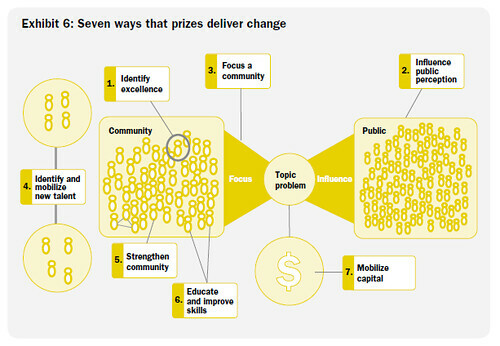 The above diagram describes the theory of change for Prizes from a recent report by McKinsey This type of thinking needs to go hand in hand with marketing strategies to ensure an effective design. What are the best ways that cause-related marketing campaigns can truly have a social impact? Beth, great post. The Chase Giving controversy is unfortunate for some who might be thinking about online contests, as fear is too often a major motivator for non-profits. I don't think you can ever completely avoid criticism in these efforts. Even BMoA's Click Exhibition was not without controversy. But anything that can be done to help these organizations focus their thoughts away from fear of controversy and feel confident in their forays into social media is a good thing. Thanks as usual for your concise thoughts and links to the excellent examples and report. JP Morgan Chase made $250 million dollars a week in profit last year. The $5 million it gave away in its facebook "community giving" contest was a tiny pittance. Nonprofits and individuals were hapless pawns in the advertising campaign of a predatory bank that is causing incalculable misery in our communities. I hope people think carefully before they lend institutions like Chase the credibility of their good names and the good names of the organizations they care about by participating in these social network marketing campaigns. Beth, I sigh at this because it was all predictable. Watching systems that succeed in changing their communities vs. systems that fail to do so (and cause havoc along the way) was the impetus for our identifying the 6 Pollyanna Principles, describing the conditions that bring about social change. The principles include accountability for end goals, not a myopic focus on means (i.e. money). They include the acknowledgment that we have an abundance or resource upon which to build vs the scarcity you note above. (This is not new age speak - orgs prove repeatedly that resources are abundant and that we have simply created artificial systems that make them seem scarce). The principles include a focus on our interconnectedness, rather than our separateness (i.e. not having us compete in contests that serve the goals of others but NOT the goals of social change). The principles include a focus on systems that allow us to BE the change we want to see - not the situational ethics of "We'll model health and community when it suits us, and model competing for survival when that suits us." It means walking the talk of our values even & especially when those values are put to the test. And all of that is wrapped in the overarching principle that we are creating the future with everything we do, whether we do so consciously or not. CHASE reinforced systems that are already at play in our sector, that go directly counter to these productive, change-making principles. They did so to suit their own needs (the amount of money they gave was so paltry that it is clear this was not philanthropy but marketing.) And they watched the whole sector do their work for them - bringing people to their site and etc. I'm sorry this is so long, but your post saddened me, again because every bit of this could have been easily predicted, when we see through the lens of what creates real social change. To create social change, we need new systems. And those systems start with us. about their choice to spend their energies getting 300 e-votes vs. pressing the flesh to get 200 $25 contributions which would stand them in greater stead down the road in terms of donations growing over time, donors becoming advocates for the nonprofit, and otherwise adding to the spread of people who are committed to bringing resources in. Oh well, another example of people avoiding the relationship-building that fundraising is all about. Beth, great post. Why am I not in the least bit surprised by this. Will 2010 be the year of 'cause fatigue'? 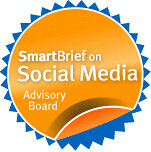 My 2010 ’cause’ and ’social enterprise’ predictions #1 ‘Cause marketing’ becomes the single greatest marketing opportunity for brands and corps wanting to re-frame Corporate Social Responsibility, with a new kind of authentic and participatory brand messaging, that penetrates deep in to the minds and hearts of consumers. This will also be the single biggest communication and perception challenge, with the spectre of ’cause-washing’ waiting to derail those initiatives that fail to deliver on the promise and media ’hype’. I would recommend to any brand or corp entering this space, to take an open minded ’launch and learn’ approach. The agility to make rapid course corrections and embrace the voice of the ‘crowd’ will separate the ‘winners’ from the ‘losers’. The 2 words that I would recommend any ‘digital’ cause marketeer have tattooed onto their forearm are, ‘COURAGE’ and ‘TENACITY’, because you’re going to need both of them by the boatload! Beth, I am so grateful for your writing about this important topic. It's certainly a thorny one, and one that needs to be discussed. As the steward of social media marketing at the Film Society of Lincoln Center, I participated in the Chase initiative, and also a prior one that was similar, the Jenazabar Foundation's Social Media Leadership Award. That prior competition asked nonprofits to solicit vote comments via their constituencies and though the sponsor organization's idea was totally laudable, the results turned out to be so shady. It becomes a contest that's not about crowdsourcing but what lengths people would go to to game the system. Perhaps because of my experience there, I didn't have huge expectations with Chase, and I do applaud their idealistic idea. It really is discouraging to see people who are ostensibly about the public good engaging in unethical behavior. You are right to say that it is essential that these efforts are better designed. I think a two-tiered process is an absolute must to avoid fraud in these situations. Beth, thanks so much for the insightful post. What bothers me most about Chase's donation program is their own lack of communication about their choices. Makes it seem that they're giving away the money purely for brand image (of course their radio-silence describing their choices only supports this). 1.5 million dollars is, of course, alot of money, but Chase's contest methodology definitely involves a of thinking that turned pretty ugly on the non-profits behalf. So many non-profits do such great work. Without knowing the contest winners' work that well(even if they were accused of fraud), just looking at their mission -- money towards any of those nominated would be a great thing. But, when it becomes a competition of which cause is better than the other -- the competition wins. Not the cause. Somehow integrity ends up being for sale, which is a horrible outcome. Two rounds definitely would make the competition and less cutthroat and still take advantage of the crowd sourcing aspect. The 2nd round though shouldn't be left to the masses. Either let the non-profits vote amongst themselves of get a panel of experts whose decision can be transparent. You're right Beth--these are GREAT comments! @SteveJennings I agree with the direction of your comment. It is because of comments like yours that I think authenticity will be highly important come 2010. I think this is one reason, that if a company is working to re-position itself or re-invent itself to be more socially responsible, that it assess its values, its own story, and its position on items that are critically important to our world. To...take a position. To take a stand. Yes, they will need to look at the consumers' needs and desires....but passion is undeniable and hard to fake. Once an organization taps into and fuels its own passions, they will be better aligned to create change for the better. Beth, thanks for a great post. I can see how this contest was bound to cause some controversy from the start. In fact, I'd say that anytime such a large sum of money is being given out in a contest fashion, you're bound to run into problems that you couldn't have accounted from when designing the program. Hindsight is always 20/20. For what it's worth, I think that Chase had good intentions with the contest, and wasn't looking to "cause wash" a broader initiative. That said, I think that they wanted their efforts to be seen by the largest number of people (hence the 'vote for me'- style contest to drive virality) and they also wanted to make sure that the money was being given to causes that were aligned with their interests/values. Transparency is always key in these situations and can help mitigate some of the problems that arose. Then again, one can design a contest thinking one is transparent and when unforeseen situations arise, one may need to adjust in a manner that may look contradictory. I think that's what happened when removing some of the round 1 finalists that Chase didn't think were aligned with their views. Finally, when it comes to voting and with such a large prize, there will always be some cheating. This isn't Chase's fault, it's just human nature as we see in political elections at home and around the world. Causes may directly cheat, and even if they don't, they can't control their supporters that may want to cheat on their behalf. The best that can happen is for the voting system to be as secure as possible to prevent any cheating (as is the case with political elections). When the voting system is controlled by a third party (in this case Facebook), much of that is out of Chase's control. In the end, we learned a lot from this experience that hopefully makes future contest owners think twice about running a scarcity contest, and helps them run the contest better if they decide to run it anyway. Transparency, authenticity, and tight controls can never be under-estimated, and neither can human desire and willingness to cheat when the prize is big enough. the focus on how the system set up this outcome is really brilliant. thanks, this kind of puts the whole story together. also like hildy's analysis in her comment above. but i think the contest had a really good outcome in both gaining so much attention and flaming out in a way that was clearly traceable. i also am totally tired of the frantic energy in the appeals i get to vote. that kind of urgent buzz is what is not sustainable. i am tuning them out because of their breathless anxiety and fear they are laden with. emotionally they are not pleasant communications when they are repeated so frequently. they don't feel good,and giving is about feeling, at the heart. Good points, but I'd also like to point out a few things. * They announced the winners on their wall without a disclaimer about "subject to verification." This is the a best practice,what Case Foundation has done with its contest which was also run on Facebook through a third party. Basically, they verified accounts because they anticipated that people might set up bogus accounts. Granted, since that contest was based on the number of donors - they had a credit card trail. * Also, if they voting was not just a click action, but voters had to make a donation in order to vote, that might have made it more difficult to "cheat." * I think some of the intensity and competition could have been lessened if they chose to give out 10 - $100K prizes and 10 $50K prizes. That would have might have lessened the competitive aspect. Another option would have been to create divisions based on organization's budget size and number of fans on fan page or could have created different "divisions" based on funding area. And, they could have involved employees and local branches in a creative way. Up until now, the largest cash prize has been $50,000. If you look at the Case Foundation - the first year they gave out 8 $50K prizes and something like 10 $10 prizes. Hindsight is easier, but these contests have been around for 3 years and there is no replicate mistakes and ignore learnings from other contests. I'm no expert, but I can't help but feel that the vast majority of participants -- voters and nonprofits -- are going to end this disappointed. How much better would it have been if every vote counted for something? A penny donation, national exposure in a Chase thank-you letter in the media, or a push to volunteer on behalf of the cause? I'm getting a little tired of people treating social media like a game, rather than a pathway to action. So many things one could say about contests such as this. But I'd like to pick up on Judith Levine's comment that this is an example of "people avoiding the relationship-building that fundraising is all about." So many of these tactics are a diversion from the proven basics of attracting support -- and especially from the face-to-face work with supporters that can have a much, much higher ROI (to be bluntly bottom-line) but that most people shy away from. That's not a criticism of social media, which has a big part to play in today's relationships. Rather, it's an observation about how people are thinking about asking others to invest in society ... the underlying model of human behavior that's at work (but usually not articulated). Here's an example: I remember hearing one nonprofit social media "expert" refer to using social media to let people play games (like voting for causes) and then after they have fun you "get them to eat their vegetables" -- meaning get them to give their own money. Now, I like vegetables, but of course he meant to equate giving with something unpleasant but necessary. The far more powerful strategy is to teach people -- actually to show them through story and experience -- that giving is a joy, a source of self-actualization and deep satisfaction. Even a spiritual journey that touches the meaning of life. This is not difficult to do with the right mindset. But it's not done with games and contests, or with a lot of the currently popular social media tactics that tap into something other than the best in people. Thanks, Beth, for a thoughtful post and for getting me thinking. So many great comments for an excellent post! During the contest, I found a cause I could support 100%, a group that helped deaf women who were victims of domestic violence. As soon as I saw I would have to become a fan of Chase Giving, I backed out. Having worked for a nonprofit which racked its brain to build its e-mail list, I could see the people at Chase figuring out ways to grab the e-mails and use them for other marketing -- marketing that had nothing to do with supporting a cause. The possibility angered me, and when I saw what people were willing to do to win, that angered me even more. Put that energy into working for your cause, people, not into competing for pie-in-the-sky money. Thanks, Beth, for a clear-headed look at the Chase contest. Beth, thanks for another great post & a wealth of resources about this controversial campaign. As an employee for a nonprofit, we were reluctant to ask our audience to vote for us. As Laurie pointed out, this was, at its core, a marketing ploy for Chase. By becoming a fan of Chase Giving on Facebook, you give Chase not only your email address, but your demographic information as well. Its relatively easy to prevent fraud. Only allow those people who have at least *20 friends* to vote... and s you get close to the end, make that *25 friends* to be over-cautious. Almost every legitimate user (99.9%) have more than 25 friends! Fascinating analysis and commentary. I won't repeat many of the smart comments above - as this particular contest seems to have been a simple list building ploy. I've been wondering lately, though, about the difference between a "contest" and a "challenge"? So while these competitions definitely do numbers 1 through 7 as depicted in the diagram above, they also deliver a direct result in the field. And coincidentally (or not so), they all phrase their contests as "challenges." If we're to pit nonprofits against one another - it would seem that at the least, we should convert some of this energy into direct action as a result... so that there's not a a bit of our supporters' energies wasted. I looked up Isha Foundation as well and just like your articles, this could be interesting scenario to see how a campaign for votes happen in developing countries unlike in America. Do you have accounts from other major organizations working overseas on how their fan base is, how they rallied support for facebook votes etc? I, too, balked at handing over my demographics to Chase and refused to sign on/vote. Chase upped the ante with MUCH more money, but this is really no different than "Hey, let's put an Amazon button on our site...sell Avon...candy bars...Krispy Kreme...etc." - and after WE do all the work, pushing some product for some company that has NOTHING WHATSOEVER to do with our mission, THEY give US a small portion of the profits! I moan, resist and refuse everytime I get a VP or director who brings me one of these pitches and explain to them how WE don't do THEIR work for them, while detracting from selling OUR org's mission to OUR list of constituents. It's an uphill battle, especially with the smaller nonprofits, who want to grab every dollar they can get. Chase just promised the biggest piece of the candy bar sale pie so far. What a collosal waste! Refer Chase Community $ 1 Million Contest. I came to know that Isha Institute Of Innerscience, Mc Minnville, Tennessee,USA and their associate Isha Foundation,Coimbatore, T. Nadu, India is one of the receipient of 100,000 US$ grant in this contest. Mercury is a dangerous metal and the above applicant Isha Institute/Isha Foundation,India is using Mercury idols for spiritual enhancement.That too in large quantities. You must be aware of Mercury danger and lots of regulations have come in force for reduction/total elimination of mercury from its present industrial/health care segments.Even WHO has come out of with Policy paper on Mercury in Health Care sector. These people are using Mercury for unscientific/barbaric methods. By way of this mail, I request you to take up with and Isha Foundation for safe disposal of Mercury and put a condition that to be eligible for Chase Community Contest, they have to be free from Mercury to save lifes and environment. Mercury in any form is dangerous to human and environment.Mercury in water can easily react with bacteria and form Methyl Mercury and is most dangerous.World Health Organisation has brought out a policy paper on Mercury for total reduction of Mercury usage,whereas these people are using Mercury for unscientific and barbaric in nature. Refer their website : www.dhyanalinga.org/theerthakund.htm and www.dhyanalinga.org/theerthakund_qa.htm ,where in they give relevance of Mercury idol and how it helps for better spiritual receptivity.